There are lots of glowing write-ups of Elsewhere as a living museum, as an artist residency, and as a thrift store where nothing is for sale, but here I aim to highlight its use of play to imagine a new politic, and the complex alternative economy and micro-utopian social experiment that have resulted. The chaos of Elsewhere that once contributed to the idea that there is still so much left to do, to order, to improve, that it is not yet time to deconstruct, has settled. Elsewhere looks, acts and feels like a legit institution while piloting several innovative models. With real respect for the project, I poke into the underlying structures and recurring trends that identify this evolving experiment. It can be hard to remember that Elsewhere is a museum. The collection is not conserved with tweezers or encased in vitrines behind motion sensor alarms. Elsewhere embraces open forms of learning, so visitors can touch, smell, and play with objects in the collection. To a passerby, Elsewhere looks like an overstocked thrift store, but you cannot buy or take anything out. left: George Scheer and Stephanie Sherman. Toybin, 2005; Ian Gamble. Skyscraper, 2007; Aislinn Pentecost-Farren. Historical Boardwalk, 2010. right: Visitors in the museum entrance. Photos: Jessie Martin. Pete Maarseven, a resident artist, describes watching visitors: “Elsewhere is a platform for art in the disguise of a store. The public is challenged: Can you pick this up, consider it, feel it, experience it and then walk away without having consumed, possessed, owned, used it up?” It is a restrictive experience for shopping savant Americans, and it tangles consumer synapses. Greensboro is a furniture and textile hub, and walking through its streets you’ll see that the antique and vintage supply is ample. But somehow walking out the door of Elsewhere makes everything else look washed out, it makes stores painfully dull, it makes shopping too obvious and it makes owning boring. That is a feat. Aislinn Pentecost-Farren. Historical Boardwalk, 2010; Christopher Lineberry. Disney Land, 2012; George Scheer and Stephanie Sherman. Toybin, 2005. Photo: Jessie Martin. 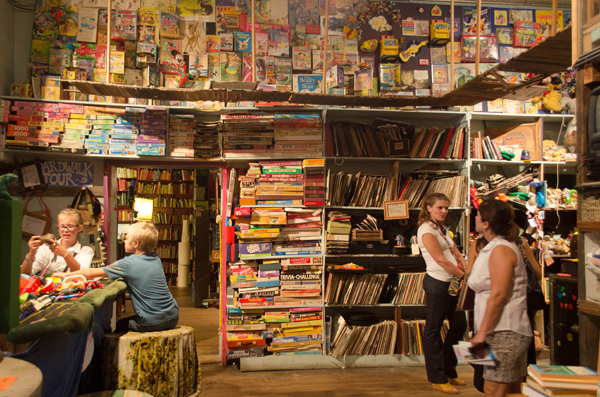 As a visitor to the first floor of Elsewhere you may stop at curiosity or confusion. With a tour you go deeper down the rabbit hole into a material nirvana of doll parts, bric-a-brac installations, and army surplus. The multilayered multiple layers, the colorful personalities, the impossibility of reaching a dry empty surface in this space may trigger a frantic overwhelm. Elsewhere first engulfs you with the unknowable much-ness of its “Collection,” then entrances with all the intricate interventions into it. Elsewhere’s evangelistic assumption is that the minds of the public will be transformed by encountering this unique experiment. It’s curators have grown accustomed to counseling overwhelmed artists to push past this initial awe. left: Amber Phelps Bondaroff. Confessatorium, 2008. right: ETC. (Elsewhere Tenured Collaborators). Cabinet of Curiosities, 2010. Photos: Jessie Martin. There is a pervasive religious tone to the Elsewhere experience. Original Collector Sylvia Gray and grandmother of co-founder and co-director George Scheer, is the omniscient, all knowing deity here. Her criteria for collecting we can never know but take on faith as inherently wise. Her selection and ethos is preserved, reinterpreted, and reworshipped as the Elsewhere experiment continues. Even the broken in Elsewhere is patched poetically. Several installations are like microshrines to the Elsewhere experience itself. There is often a feeling of being drawn to engage with the collection, then being repulsed by the sheer magnitude of it. The choices are bewildering. Systems of comparison become awash in endless relativities. upper left: Angela Zammarelli. Ribbon Room, 2008 and Dayna Friz, 2010. upper right: 3rd Floor Workshop and fabric bolts. lower left: Leslie Kelman. 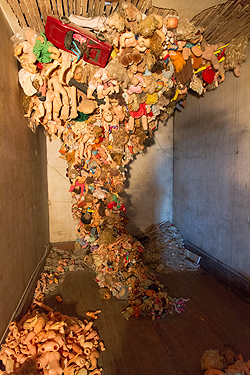 Safe Place (aka Fabric Fortress), 2011 and Sarah Goetz. For Those Who Seek Unseen Skies (one orbital body away from infinity), 2012. lower right: Emilio Rojas. If Not Us, Who?, 2012. Photos: Jessie Martin. How do people behave in it? You feel the need for time. For more attention. For more hours of quiet space just to deal with the stuff. Strategies of isolation (nooks, forts, hideaways) are popular. One of the most common reactions to Elsewhere’s collaborative, circulating living spaces is to create individual spaces of one’s own. left: Elsewhere Library and Aviary. Photo: Jessie Martin. right: Nicola Winstanley. Curator Creator, 2011. Photo: Carrie Schneider. Other overarching trends include remixing and redigesting. Awash in this sea of undisposable collection, people fixate on efficacy and arrangement. It’s a futile attempt at absolutes. You cannot cohere the collection, the space, the experience into tight enough categories to make sense of it. But you kind of can with people’s reactions. The generosity of endless possibilities triggers a monotony of common approaches. Throughout Elsewhere, a very coherent aesthetic forms from common raw materials. Countless hand lettered signs, salvaged wood constructions, collaged surfaces, ribbon reuses, and doll amalgams settle into forms somewhere between cute and creepy. Many residents wear an improvised uniform by dressing in Collection. Several Elsewherians have Collection-ink tattoos. And while the objects are permanent, the population is fluid, though maybe always versions of the same types the way there are discernible heaps of “dolls” and “games” and “ribbons” and “books” at Elsewhere; transient, whimsical creatives stopping for a time to rearrange old piles. left: J. Morgan Puett and Mildred's Lane. Kitchen Commons, 2011. Photo: Ben Boyles. right: Staff, residents and volunteers before SPIRIT fundraiser. Photo: Jessie Martin. There are chores, a drilled-in ethos of stewardship. People shuffle around cheerfully contributing. There is an extreme lack of snark, cynicism, complacency. This is a place for genuine and earnest art workers. Competition cedes to collaboration in the wider project. Most artists in residence pay their own way to contribute to the Elsewhere metaproject. The people here, at least in my round, are fans of Project Row Houses, StoryCorps, Jane Jacobs, Social Practice, and good-hearted-can-do-world-improving work. It is not cool to act cool at Elsewhere, it is cool to be engaged and improving things for everyone. Claire Bishop’s prizing of agonism doesn’t jive here. Elsewhere is a congenial micro-utopia, but it does not model democracy. You really are a cog in the bigger machine. There are tiered entry levels. Volunteers take cues from Interns who help Curators who work under founders/directors George Scheer and Stephanie Sherman. Elsewhere hosts approximately 50 artists per year, 6 at a time, for 3-6 weeks stays. Artists pay $500 for room and food, but the unpublished cost of one residency is $1000. By this count, every residency is scholarshipped. Select artists in residence also get paid depending on who fits the North Carolina Arts Council’s grant stipulations that year. Generally these artists have longer stays and projects that complete infrastructure improvements for Elsewhere. So far this tiered model hasn’t been explored for how it could set up an art underclass or a dynamic mentoring system. Internships are usually filled by local college students who work for three months under a curator. They stay and eat for free, and the position is seen as a resume booster. Elsewhere likes to hire internally, so an internship does increase your chances of moving up the food chain. Each of Elsewhere’s “fellows” has a curator title: Production Curator, Programming Curator, Communication Curator, Building Curator, Education Curator. Everyone with a curator title draws in some stream of income, whether from grants, fundraisers, or resident fees. A lot of former residents and interns return to be curators, and these longer, more in depth positions seem to account for directional shifts at Elsewhere more than the artists. Curators give consultation, permission, and support to the artists. They get grants, audiences, and press for the projects. Staff (curators and interns) do the primping, programming, public outreach and practical improvements. left: Mid-residency artist feedback session. right: Elsewhereians working at the front desk during First Friday. Photos: Jessie Martin. In some respects, Elsewhere runs a curating residency without calling it that. On the other hand, curators spend much of their time “just being staff,” putting out fires, and fulfilling the broader mission, than conceptually ordering their own ideas. The experience could also be called a Fellowship or a crash course in camp counseling. As of 2011 curators began receiving a $500 stipend in addition to room and board, and as of this year they are receiving $1000/month. Currently, the House Manager and the Documentarian are out of this loop expressly because their work is not tied to an income stream. Though not commissioned based, the current pay structure does not appreciate the House Manager for catalyzing much of the social interaction, organizing mealtimes, and being the de facto volunteer coordinator who welcomes community youth currently experiencing homelessness to feel at home at Elsewhere. One of the issues, I was told, is that this year is the first time the Hospitality position has been so aptly filled (by Emily Ensminger). She’s been invited to formally propose a Curator position for herself, but it may compensate her to book and manage commercial event rentals of the space while leaving its everyday, internal uses unvalued. The Documentarian position is seen as being its own compensation as a portfolio builder. In addition to photographing all of Elsewhere’s events and being a press liaison, the Documentarian provides the artists their take-away from Elsewhere. Because Collection can’t leave, artists projects made from it cannot either, so artists rely on documentation exclusively for evidence of their labors at Elsewhere. Positions are somewhat fixed, laborers who fill them are not. As of this year, two administrative staff will work through the winter in a heated offsite office space, but all other positions last up to nine months. Ideally this allows curators a season to pursue their own projects, but during the break staff often decide not to return. After two years at Elsewhere and finishing his PHD in Education at UNCG, Education curator, miracle worker, and grant magician Christopher Kennedy, will be moving on. It can be hard to keep that level of talent anchored in Greensboro. Elsewhere prizes the growth and maintenance of a unique, locally specific culture, but not all the bearers of it stay around long enough to see it through. This is one of the ways that Elsewhere backstories get lost. For example, because positions don’t often overlap to pass on learned wisdom, each Documentarian individually discovers equipment quirks, each Building Curator learns their own inventory of materials, and each tour guide skips or amplifies wildly different projects in the space. Scheer and Sherman are the long term voices. At its best, this rapid turnover replaces burnout and keeps the structure fresh while also prompting continuous, collaboratively informed revisions of their history. From a practical standpoint, it is a headache- but at times a generative community-building headache. You have to ask around, piece together the story, and trade knowledge orally with one another instead of consulting an official archive. Elsewhere is taking steps both toward cataloging itself and to fortify it’s staff’s positions. The puzzle is how to fairly compensate the staff’s contribution (without reducing it to a monetized value), while also funding a new residency/museum model (in a city that has no precedent), while inspiring good art (that is compelling for the public and fundable for the sponsors), without letting the building fall down. Like most artists bringing forth two works simultaneously – their creative projects and their own creative way of surviving, Elsewhere has to keep up its attempts to do good within our existing economic system while also piloting better ways that are not (yet) compatible. left: Museum entrance information desk, with Stephanie Sherman (right). Photo: Jessie Martin. right: Aislinn Pentecost-Farren giving a resident orientation. Photo: Brennan Broome. Finally, if you happen to be at Elsewhere when the lights are dimmed and the population gone, it is an incredibly sad, lonely, and eccentric place–filled to the brim but somehow still a shell. It may not even need to be said, but it is the people who make this work. How does it use resources? In Sylvia’s lifetime the collection was a livelihood, a compulsion, and a conduit for social interaction. It provides consistency of material while the population and systems are constantly changing. It provides a massive third mediator between people. Preserving it creates the need and the excuse for tight control. Keeping order despite it creates a culture of conscientiousness. It sets Elsewhere apart from other art organizations. It aligns Elsewhere close enough to a museum to be branded that way. It compels intangible creativity to rise to the occasion of tackling material excess. It still holds so much to excavate, pioneer, and play with that it contributes to an extended whimsical state of discovery. It challenges artists to engage with and renegotiate it rather than fill up blank space with a priori ideas. When George and friends first came back to 606 Elm Street after it had been boarded up, there was hardly a path to walk through. The collection is so vast it looks like it could never run low, but as things are increasingly chopped, frayed, and incorporated into projects, it is increasingly evident that the supply is in fact restricted. The philosophy is to make a limited supply constantly renewable. Collection is raw material that you can profit from but not exploit. You must cultivate it, respect it, draw forth its greatest potential and leave behind a workable, perpetually legible, modular, interactive work of art. Several Elsewhere’s installations nod to this eerie playing out of a doomsday scenario where we’re trapped on the Elsewhere island and herein lies our only resource. Andy Sturdevant. 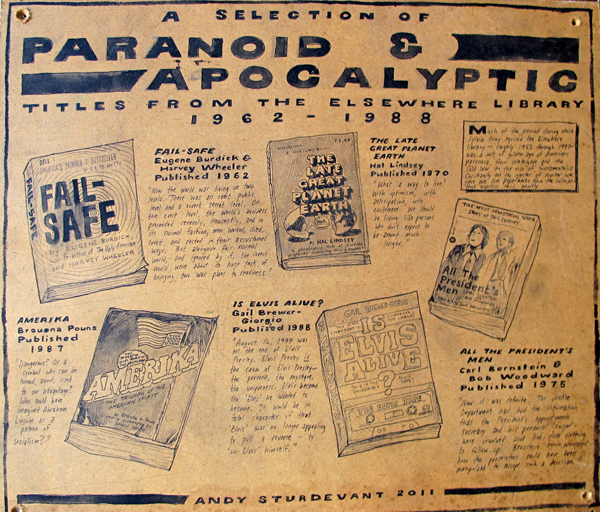 Paranoid and Apocalyptic, 2011. Photo: Carrie Schneider. Kim Holleman. Toynado, 2007. Photo: Jessie Martin. An intermittent chorus of “Is it Collection? Make sure to keep Collection. Oh, it’s not Collection. Be careful with Collection,” replays daily. Dust pans are sifted for tiny scraps of Collection, saved from disposal and not permitted to leave. To don this degree of awareness and anti-convenience is an earnest, exhausting feat. A tall order, yes, but one could argue a necessary mindset for us moving forward. You would think that this unquestioned vigilance would elicit a counterattack from artists who, in the avant garde tradition, are supposed to question established values. But thus far, no one’s set fire to a heap of Collection in protest. Maybe the screening for residents and projects prohibits it- and maybe it must, because one instance snuck by may undermine the whole project. But what is lost when use and exchange are insulated to this degree? As outlined in the next section, a proposed project has to be enough in line with Elsewhere’s preexisting mission to pass, so works are more likely to contribute in a reaffirming- rather than transformative, way. Very dull projects do fall within the spectrum. Grand, possibly problematic problems do not. Sylvia formed her collection and now George and Stephanie form theirs. We only have clues to the systems Sylvia was using; a mix of hoarding neurosis, an affinity for buttons, plastic bag assemblage, and the ability to assign people to their objects. Elsewhere as a museum of consumer surplus in America slowly becomes an archeology of the trends, tweaks, and tendencies of the artists that pass through, as well as the curatorial sieve that determines them. First, artists self-select for their desire to interact with Elsewhere by submitting a portfolio and answering application questions. The application itself is a work in progress as Elsewhere further specifies and evolves its mission. Out of 160 applicants last year, 50 artists were accepted. Artists are chosen for the strength of their work, the compatibility of their practice with the Elsewhere model, and their personality’s ability to deal with the Elsewhere environment. Phase II is a Skype interview. Once accepted residents arrive they take at least three days to marinate in the collection, and then submit their proposal to (as of this year) all of the curators. Then comes the “roundtable,” which is more of a panel review. Here proposals are vetted by the curators not just for the sake of the project’s interesting qualities and viability, but for its impact on the Elsewhere project as a whole. – re-curate displaced items. You can’t just put them in a pile because someone will have to deal with it eventually. With these stipulations, Collection can be used for art, but not always for living. Last year as art J. Morgan Puett of Mildred’s Lane helped reconfigure the kitchen into a useful space, but you cannot use Collection glasses, cookware, or aprons within it. Kitchen orientation begins with a showing of Discipline of Doing Easy, but the daily flow of the kitchen is viewed as a feat of engineering than an act of choreography. While Caro Clark erected Skyscraper Garden, no Collection is allowed to be used or placed outside. Besides the new room improvements and bed dividers by Angela Zammarelli and Mary Rothlisberger that resulted from the transformative Comfy Residency, there are few Andrea Zittel-style pods or scaled innovations for utilitarian purposes. These fuzzy lines around use and value could be one of the most dynamic investigations that Elsewhere sustains, or it could simply mirror the status of its “service” staff beneath the creative class of Curators. Elsewhere is not explicitly premised on lasting forever, though Scheer gives it at least another good 30 years. With this parameter in mind, it seems like the experiment can afford more risks. left: Angela Zammarelli, Mary Rothlisberger, Jay Gamble. Creature Comforts, 2012. right: J. Morgan Puett and Mildred's Lane. Kitchen Commons, 2011. Photos: Jessie Martin. Elsewhere’s use of space is radically hybrid as an unzoned overlap of public/private, art/life, temple/stockpile. It is also a three story curio cabinet, preserved house, a performance venue, a stalled store, a school, and a retreat space. With all its “City” departments, art installations, residency and staff lodgings, meeting space, and more minute relocations and renegotiations of precious inches every day, you couldn’t ask for a more hyper concentrated study of land use. left: Peter Maarseveen and Chris Kennedy. Pinhole Camera Playshop, 2012. right: Steven Lang’s artist talk. Photos: Jessie Martin. Elsewhere has its role to play in the urban renewal of South Elm in Greensboro. While I was here, George was in meetings with the United Arts Council for grant money to rejuvenate downtown and they set up a participatory Urban Planning Lab in partnership with Provisions Library. The back alley is technically a public space and the first floor is open to the public Wednesday-Saturday 1-10pm for a $1 entrance fee. Artist talks face the street with speakers and seating on the sidewalk. While I was here Colin Bliss installed three swings on the front stage that literally interweave the interior of the art institution and the commons of the street. Political Party First Friday with Colin Bliss. Swings, 2012. Photo: Jessie Martin. On this same stage they project Presidential Debates and Election returns, and last year they hosted a community-member-curated Living Room Lectures Series. Chris runs CoLab that hosts weekend playshops and instructs high schoolers in media literacy and experimental sound projects. The surrey (4-6 person bike cart) is pedaled around town for tours and promotions. During open hours a small posse of local teens volunteer here. Elsewhere’s urban green campaign installed solar panels and revamped the garden in the back alley. We eat from a vegetarian food co-op. 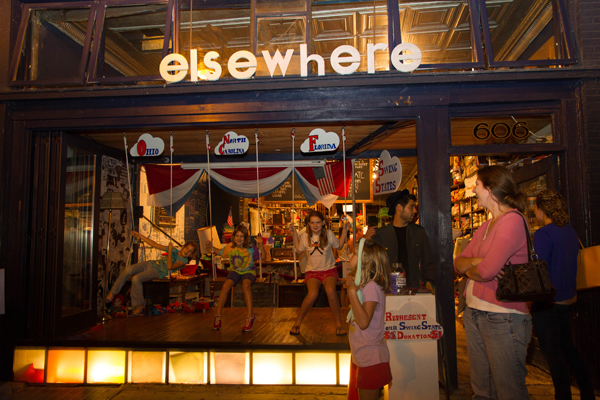 Elsewhere represents itself in local art and food truck festivals. Ultimately, Elsewhere’s range of outreach and community activities is kind of like its collection, expansive and unknowable- it acts on all fronts. Although Elsewhere, like many arts institutions today, is moving towards more educational and community outreach components, it is most powerfully social in its implicit structure. With decreasing frequency, Elsewhere puts on its most unique program, a full performance of the Elsewhere Commonweath called CITY. Everyone takes a character, costume, and function in the City. The currency is buttons, there is an internal post office and postal worker who delivers messages, a press office that reports internally, a cop ticketing citizens, a doctor seeing patients, a customs office, a school, a restaurant, a library, a departments store, and whatever other institutions, bureaucracies, and civic entities players wish to embody. CITY is a micro epitome of the increasing trend of artists trying on other professions, except in CITY they have to play at creating a society among them. left: Play CITY. Photo: Jessie Martin. right: Play CITY. Photo: Ben Boyles. As Elsewhere reaches a kind of adolescence, how it plays at being a city and how it actually is an influential part of a city’s development are foregrounded. Elsewhere has grand moral plans for Downtown Greensboro that it also needs to apply within the building, and hopefully without losing credence in the play that got them where they are. Though this three story building is billed as manifest destiny for chosen artists, progress is not fixed. Elsewhere is a long-term physical theatre of cerebral deconstruction. 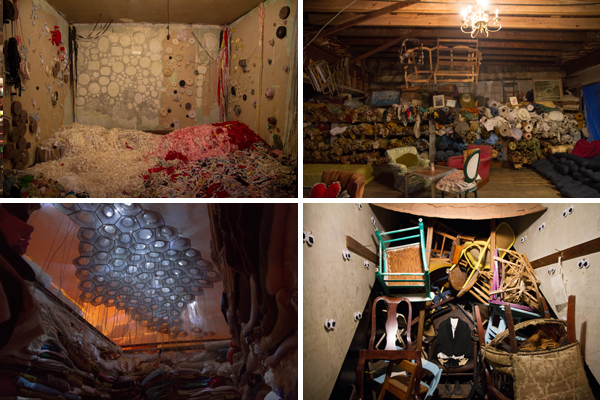 Artists’ projects get built, dismantled, and recycled. Curators and interns develop working models each season that may or may not get passed along. Everyone’s Elsewhere experience is different depending on when you go and who else is there. Here’s a video from when the shower was a curtained off hose in the back alley. As a brand Elsewhere is a shape shifter, othering itself from one box by approximately fitting several. Surreptitiously political, without ever saying “global warming” Elsewhere loops visitors into a microeconomy based on hyperlocal resources, a cohabitative living situation, a kitchen collaborative, and a theatre of civic reimagination. It slides by on these issues by using the categories of thrift store and museum as innocuous veils for the playshop of alternative systems beneath. left: Angela Avery. Garden Wall, 2012. right: Emily Wynn Ensminger. The Ground Up (Skyscraper Garden), 2012. Photos: Jessie Martin. Elsewhere already reads as the shabby chic mecca from which all Anthropologie displays are inspired. It’s wisdom, though, is not in being commodity-legible, but in sincerely valuing moments when visitors reminisce with a McDonald’s Happy Meal toy. Its strongest insulation is the paradox of its collection. Elsewhere plays on “use” and “value” by requiring new ways of using, without using up. At its best, Collection facilitates not a clear cut trajectory toward when an item is consumable, but a wafting investigation of all the stages of not arriving there. Parallel to the ethical/aesthetic arguments of social practice, the line in the sand is drawn between micrutopian readjustments and cataclysmic revolutions. Will we work inside of the system with discreet, but therefore undetected subversions? Or will we assault the system by only using modes and methods from outside of it. Which one has the greater risk of absorption by Capitalism? Which one has the best shot at imagining past it? Elsewhere’s approach seems to be to do all the possible regardless, but it is still worth noting that somehow those first Elsewhere mandates “Nothing will leave” and “Nothing is for sale” trick this trap. By hoarding, occupying, and playing up its own neurotic origins in consumer surplus, Elsewhere detournes that which may otherwise co-opt it. If Elsewhere is a closed circuit model of working with finite resources in which things are constantly being reordered, then what systems of order should be privileged? At Elsewhere these answers, like its installations, are not given once and permanently preserved. Each season you’re likely to find a new configuration of post-capitalist creative surplus. 1. Elsewhere does not explicitly claim that this mission, but does allude to it via interests in the wider realm of social practice. See also the companion interview to this post. 2. a.k.a. Agonistic Pluralism, the theory that unresolved conflict and debate are positive aspects of political engagement in contrast to any hegemonic consensus which silences potentially generative dissonance and precludes discussion and exchange. Bishop suspects social practice projects that provide superficial, uplifting untangles instead of complex, unresolvable inquiries that sustain tension. 3. There is also a board, or “cabinet”, that I didn’t hear of until my last days there and have been unable to research from afar. 4. It can quite literally hide, sequester, and barricade you from others: Fabric Fortress, Fabric Castle, Aviary, Alone Zone. 6. Informally, there is talk of residents “borrowing” collection, and this is regarded alternatively as a curse that “ghosts will haunt you” or a token that all Elsewhereians are somehow interconnected via this dispersal. 7. “…art enters a realm of useful, ameliorative and ultimately modest gestures, rather than the creation of singular acts that leave behind them a troubling wake.” Claire Bishop, Artificial Hells: Participatory Art and the Politics of Spectatorship, (London and New York: Verso 2012), 23. 8. As in our post industrial, post-Fordist, service economy, “Added value and profit depend on an immaterial, imaginary dimension of the goods involved” and “distinguishing invention from occupational, automatic, and routine reproduction, and on the other hand, neutralizing the division between mindlessly repetitive routine labor as subjugated activity and creative intellectual invention.” Keti Chukrov, “Towards the Space of the General: On Labor Beyond Materiality and Immateriality,” trans. Ainsley Morse, 2010, available here. 9. “…a reductive mode of thinking in which in which a properly chaste ‘revolutionary’ desire (uncontaminated by any external determination) is juxtaposed to a compromised ‘reformist’ practice that enters into negotiation with existing power structures…” Grant Kester, The One and the Many: Contemporary Collaborative Art in a Global Context, (Durham and London: Duke University Press, 2011) 123. “art is perceived both as too removed from the real world and yet as the only space from which it is possible to experiment: art must paradoxically remain autonomous in order to initiate or achieve a model for social change.” Claire Bishop, Artificial Hells: Participatory Art and the Politics of Spectatorship, (London and New York: Verso 2012), 27. Excellent; a spot-on analysis. I feel like an Elsewhere expatriot having been a resident artist there and now reading about it, elsewhere. Thanks, Carrie!